AC Schnitzer has been attracting attention for almost 30 years, and not just as a specialist for BMW tuning. The Aachen-based tuning specialist also offers custom-made and unusual components for MINI vehicles. The Hatch, Clubman and Cabriolet by AC Schnitzer meet the wishes of the typical MINI driver for an individual, striking and expressive vehicle. Expressivity on the road is provided by AC Schnitzer with performance upgrades which come with a two-year warranty, e.g. for the MINI Cooper from 136 HP to 170 HP. 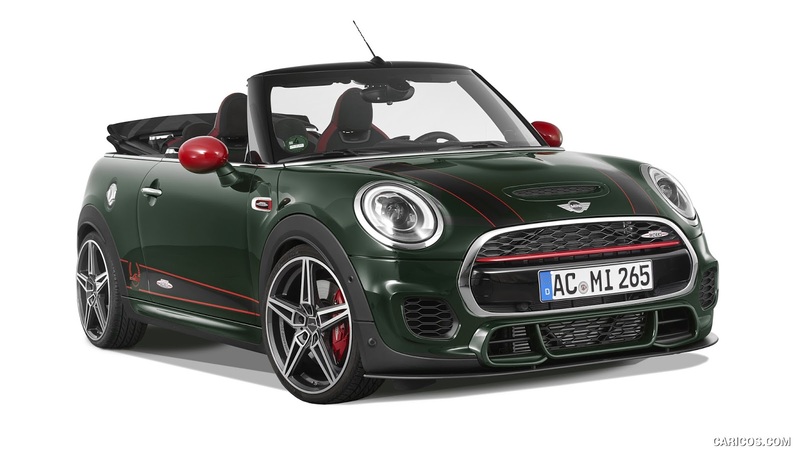 Sporting desires are fulfilled by the MINI Cooper S which, after the performance upgrade by the AC Schnitzer engineers, delivers 235 HP instead of 192 HP. The MINI JCW benefits from a power gain of 34 HP from 231 to 265 HP. A striking note is provided by the exhaust system, available with or without sound pipe. Rear silencers with integral exhaust gas valve, tailpipes in "Sport" or "Sport Black" design, and "Track Mode" valve control with remote control for sound optimization, are an essential feature when MINI drivers want to express their individuality. The AC Schnitzer Racing exhaust system also comes in a particularly extrovert export version. Like all exhaust systems for the MINI, the origins of the striking sound are revealed with the AC Schnitzer "Sport" or "Sport Black" tailpipe. The bodystyling components from the Aachen-based company provide a more individual look for enthusiastic MINI drivers. The aerodynamically efficient front splitter doesn't even need painting and is easy to install: thanks to its surface structure which precisely matches the standard wing recesses, the AC Schnitzer front splitter is always a perfect fit - whatever the colour of the base vehicle. Together with the décor set, the rear "Technology & Design" sticker and the rear skirt film, a great appearance is guaranteed. The MINI by AC Schnitzer also stands out with expressive design in the interior. Aluminium pedals and footrest, together with velours floor mats also impress the passengers. The AC Schnitzer range naturally also includes AC Schnitzer wheelsets based on the new AC1 BiColor or Anthracite alloys in 19-inch. These rims were specifically developed for the current generation of MINI with its modified pitch circle. They are fitted with tyres size 215/35 R 19 or 225/35 R 19 for the Clubman all round. Together with the AC Schnitzer suspension spring kits (lowering by approx. 20–30 mm at the front, approx. 25-35 mm at the rear), the MINIs by AC Schnitzer are not only sure to drive safely through corners but will always be on the wish list of all MINI fans looking for a more individual, striking and expressive drive.